This article was originally posted on The HuffPost Business. If you buy into the myths circulating around the advertising and marketing industry, you’d think marketing to Millennials was just the easiest thing ever- or if not easy, a matter of just following simple steps. In fact, all the “typical” Millennial brand needs to do to succeed is to be authentic (whatever that means), use a mobile first (and social media second) approach, align its values with the values of its consumers (behind a powerful purpose), and promise to make the world a better place. And then, strategy in hand, you’re ready to create! All you need is a group of early Twentysomethings, preferably from various ethnic backgrounds with a few hipsters mixed in (after all they are one of the most ethnically diverse and tolerant groups) having fun on a road trip, jumping off a cliff into the ocean fully dressed (they love nature but they value style as well), doing some cool artwork with some recycled material (after all they are all about creativity and self-expression but also care about the environment) or enjoying a rooftop party in Brooklyn with the Manhattan skyline in the background. As long as you’ve done that, your creative will turn indifferent Millennials into eager brand fans that will willingly torment their friends into buying your brand as well. To address this issue and turn the stereotypes, half-truths and generalizations about Millennials into specific and actionable insights, First-The-Trousers decided to analyze 76 North American case studies of effective marketing to Millennials. We wanted to focus on brands and campaigns that successfully engaged Millennials in ways that led to business results, rather than on what experts claim or the research learning that usually tries to identify a (lowest) common denominator among the 80 million consumers. For the data, we relied on WARC and its case studies database which includes Effies, Creative Effectiveness Lions, MMA Smarties awards, etc. and covers the last ten years. A summary of the learning can be found at www.first-the-trousers.com). Millennials are one homogeneous consumer segment. One of the major appeals of Millennials as a target audience is that there are 80+ million of them out there. That’s a lot of wallets and future consumers. The only problem is that there are many different types of Millennials with very different needs, aspirations and life circumstances: the college kids, the 20 year old blue collar worker, the video game player, the young graduate looking for her first job, the young couple about to get married, buy a house and expecting their first child, the single working mom with 2 children, the freshly divorced 34 year old man re-entering the dating market, and so on. The only way to appeal to all those different segments as one is in our opinion to identify the lowest common denominator across these sub-segments, an approach that never really leads to success or to a truly differentiated idea. Interestingly, 79% of the case studies of effective marketing to Millennials we looked at went beyond the generic criteria used to “capture” Millennials and instead identified sub-segments better suited for their marketing efforts. These included everything from specific category-relevant behaviors (“beer transitionals”), life stage (new home owners) and big life events (young parents delaying potty training), social-demographics (men in their early 30s with higher HH income), gender, ethnicity, geography, passion points (Zombie fans) and interests, etc. In other words, successful Millennial marketers do not target Millennials as one homogeneous segment or as a generation, but instead focus on sub-segments defined by more useful and actionable criteria and variables. 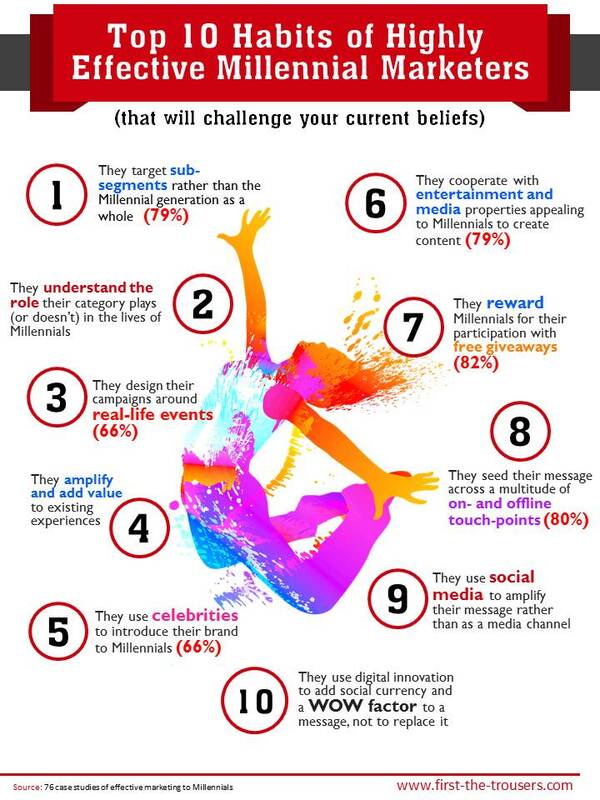 Millennials are digital natives. While this statement is technically correct, in that they don’t know a world without internet and smartphones, the implication and conclusions drawn from this fact usually are not. In fact, talking about Millennials as digital natives usually implies that they need to be targeted online (using their phones as access point) first if not exclusively. However, this implication is not consistent with our learnings either. In fact, out of the 76 cases we looked at, 80% used a combination of online and offline channels to reach millennials with their brand message. Further, two thirds of the campaigns we looked at also interacted with their audience through live events that were built into their marketing plan. It appears that the analog world is still the best place, even for digital natives, to experience the world and create stories that are then worth sharing with social media via smartphones. Millennials are all about Do-Good marketing. A third myth about Millennials is that they are all about do-good marketing, that all they need is to be aligned with a brand’s higher purpose and values to be turned into avid brand ambassadors. And while I have no doubt that they are socially responsible (maybe even more so than the generation before them), it doesn’t mean that they’ll buy anything and everything at a premium simply because the brand promises to save the world. Do-Good campaigns were actually the exception in our sample of 76 effective case study of Millennial marketing, rather than the rule, with maybe the most prominent exception we looked at being the Pepsi Refresh campaign from 2011. On the other hand, 80% of the cases we looked at included some sort of give-away to incentivize participation. Our conclusion therefore is that a brand is more likely to engage a Millennial by giving them free stuff than by promising them a better world. Millennials are often thought of as a generation for which the conventional principles of effective marketing and communication do not apply. And the large amount of Millennials research out there, as well as all the Millennial experts out there, seem to perpetuate this myth. Our research and experience shows that instead, they are a group of very pragmatic consumers that demand value and substance from the brands they chose to interact with and that responds to sound, insightful and creative marketing programs just like any other consumer segment. Millennials just happen to have grown up in a digital world and therefore are way more familiar with the digital and social space than most marketers trying to appeal to them.